If your cabinets are unattractive but otherwise in good condition, you do not need to invest in costly cabinet replacement. At Cabinet Magic, we can work with your budget to create a brand new look for your kitchen. How? 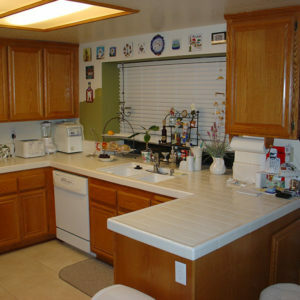 The answer is custom cabinet refacing in Westminster CA. What Is Cabinet Refacing in Westminster CA? Cabinet refacing in Westminster CA is a cabinet remodeling service that allows you to replace only what needs replacing for maximum visual impact: your cabinet doors, drawer fronts, and crown moldings. To complete the look, we’ll cover any exposed cabinet surfaces with a new material matching your new cabinet doors and drawers. Because Cabinet Magic will custom create your new doors and drawer fronts, you will have complete design control. We have the ability to fabricate any style of cabinet door along with a complete range of paint and stain options. To get new functionality as well as a new look from your cabinet refacing in Westminster CA, you may want to consider getting new features like soft close hinges, drawer divider inserts, and pull-out shelves as part of the project. It’s Cost-Effective: Compared to the cost of custom fabricating all new cabinets from scratch, cabinet refacing is a much more affordable means of achieving the clean, fresh, updated look you want. You can save hundreds of dollars. It’s Convenient: Cabinet refacing spares you the mess and hassle of having your kitchen turned into a reno zone, as would invariably occur with a total cabinet replacement job. Instead, the work can be done quickly and neatly without disturbing your whole kitchen. It’s Eco-Friendly: Even when best efforts are made preserve old cabinets for reuse or recycling, you’re going to generate a lot of waste when you get new cabinets. Cabinet refacing generates much less waste and requires less new materials, so it is better for the environment. At Cabinet Magic, we have a professional team standing by ready and willing to start helping you with your cabinet refacing in Westminster CA. Our top-quality craftsmanship, combined with a dedication to customer service, allows us to consistently meet and exceed client expectations. To learn more about how we can improve the look of your kitchen and what it will cost,Call 800-828-4380 and request your free in home estimate.